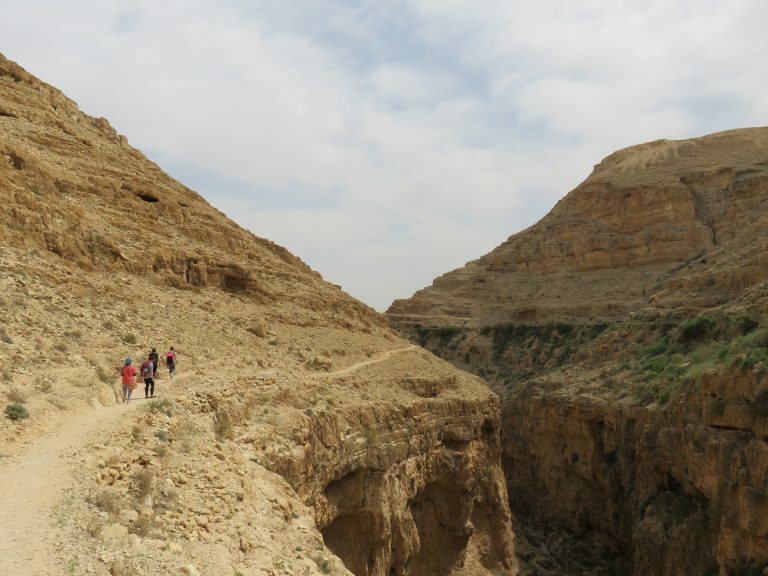 Spring 2017 interns hike along the edge of Wadi Qelt near Jericho the first weekend after they arrived in Nablus. So, where to start? Nablus, here I am. It’s almost as if I have been dropped here from the sky like the human icon from Google Maps is, straight from Western Europe but naturally without the dragging aspect. At first glance, Nablus is almost like a scene from a movie, a Hollywood blockbuster where white ajnabi (foreigners) visit a distant land in the East, shrouded in mystery which is heightened by a rich culture and unique attire. The dusty landscape rises and falls at every turn, with thousands of years of history etched into its surface. The cuisine is just as indescribably wonderful in how the flavours blend and contrast, completely overshadowing anything that I attempt to pass off as good food. And the language ties all of it together in the flow of the writings and the unfamiliarity of the foreign sounds. Yet, despite these discernible features that diverge so distinctly from my normal life, the city already feels like somewhere I could call home. Because, for all the differences that exist between my country and this one that make them both so inimitable, my three weeks here has shown me that there are almost as many similarities between the two. For one, the hospitality of the local people, and the TYO staff in particular, remind me the warmth of those back home in my community and places I have worked. Reflecting on the highlights to date, there are so many memories that I would like to share. However, there is a distinct common link between many of them; the people I’ve met. This cannot be overstated. I find that wherever I travel that the people I meet are always a huge deciding factor in how I feel about any place. Everyone working at the organisation has been so kind, welcoming us interns with open arms and many of the locals mirror this friendliness as we explore the city after work. Here is no different. From the smiling local shop owners who occasionally give us free food, to the groundskeeper who makes us tea and plays the guitar, the staff at TYO and the small family that has formed on the seventh floor, there are so many people who have contributed to my happiness here. It really feels like a new home. Painted trees near the park in Nablus provide a colorful path for exploring. Another key parallel to home I can see is in the children of all ages with whom we work. I have previously had the opportunity to volunteer with kids from a range of different countries including Ireland, South Africa and Germany in different activities. What is abundantly clear to me is that children are the same no matter where I go. They want to play, laugh and be loved just as any other kid does. The four year olds that I teach want to colour in pictures, they want to sing and dance, they want to high five. The boys and girls that I train for football are no different; one group wants to train to become the next Ronaldo or Messi and the other wants to giggle, socialise and, more increasingly, actually kick the ball. What does stand out with these children versus others that I have worked with before is the resilience that they have in the face of their ever-changing situation and challenging conditions. I’m sure that this is something I will experience time and time again during my internship here, in my new home. I hope that I can bring a little happiness to them through my teaching as they already have brought to me.